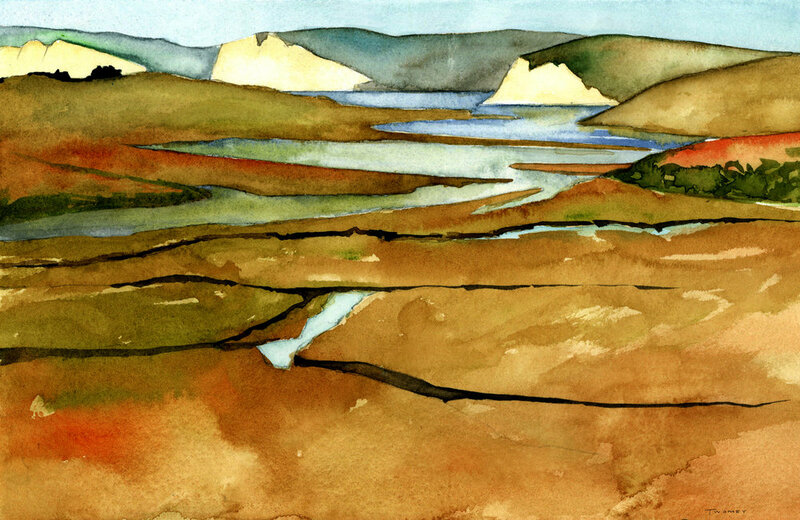 Headed to Mesa, AZ Museum Exhibition "Tomales Point, Point Reyes, CA"
"Tomales Point Trail, Point Reyes National Seashore Park" is framed and ready to ship to participate in the "Roadside USA" exhibition at the i.d.e.a. Museum in Mesa, AZ. Proud to participate, the curator said he chose my work because he wanted work that looked like it had actually been done on the road. It was. 18 X 24” on gessoboard; acrylic and mixed media. The way the mist would flow in from the Pacific, up the dunes and over the hills set such a mood. This cove had fighting sea lions and hundreds of species of birds that I couldn't begin to identify. Whenever I have a bad day (today, unfortunately) this is where my mind goes. 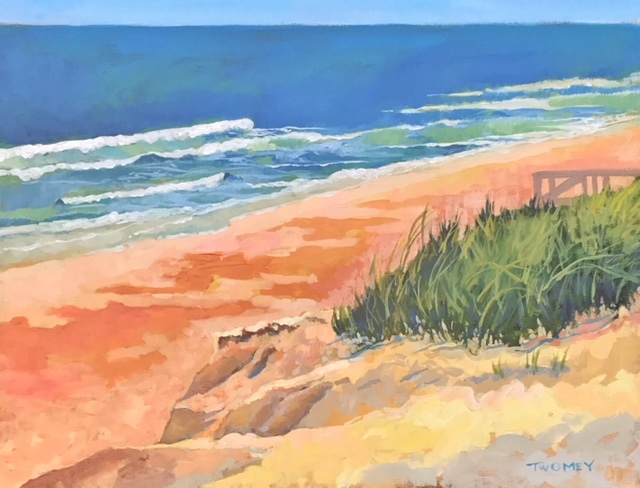 May 25 & 26, 2019 - Kenilworth Art Studio Tour! Very excited to take part in this tour! If you have a chance, come by - I’ll have originals, prints, oils, acrylics, drawings, etc.! “Limantour Beach Estuary, Point Reyes, CA” about 10:00 am, tide slowly coming in. I pleased to say that three of my works have been selected to appear in an exhibition at the IDEA Museum in Mesa,, AZ. The exhibit is focused on families, showing how artists go to all sorts of different places around the country to paint their reaction to the world. The exhibition will run from June, 2019 until Oct. 2019. 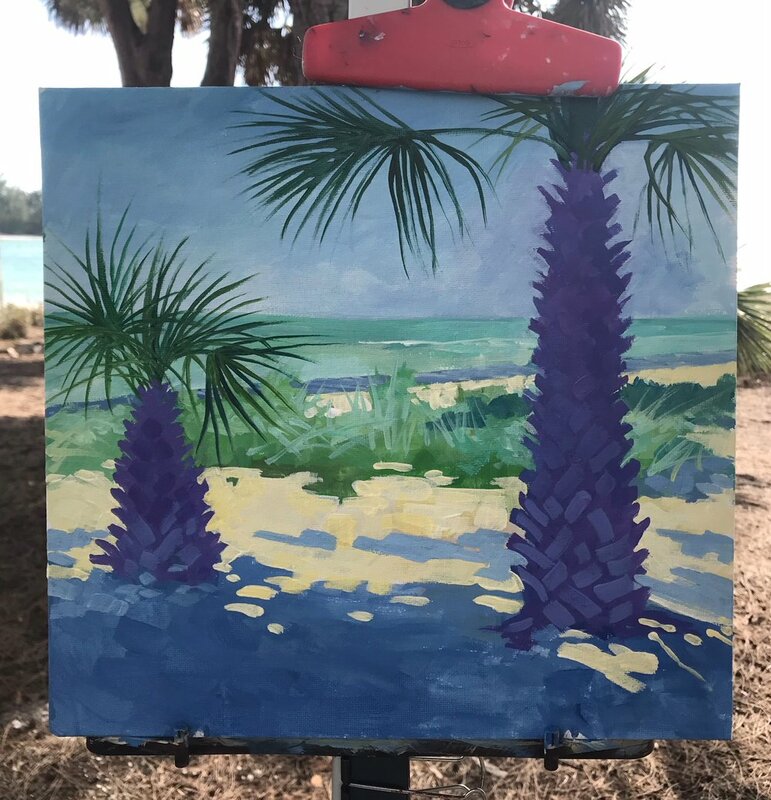 Work In Progress: "Anna Marie Island Sun's Departure"
Finally, I’m home again! Spring is springing and I’ve been getting some painting and some gardening done, so yeah! 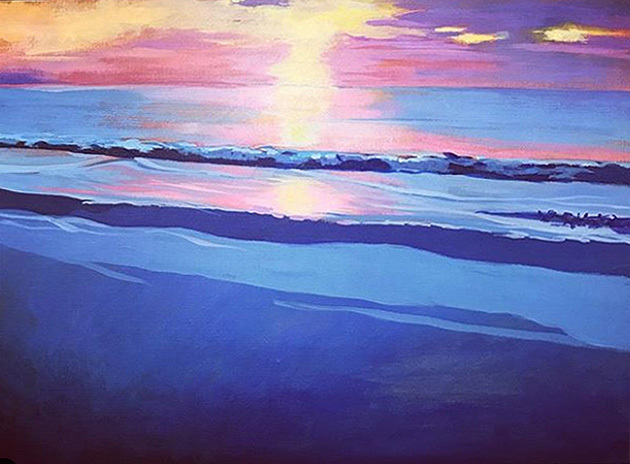 Often while on Anna Marie island I would plein air paint the sunsets, which were spectacular. I’m thoroughly enjoying simplifying the shapes and colors. This will be posted for sale soon. 12 X 16” acrylic on canvas board. Available. This plein air painting was a joy to do. I set up early and within an hour was surrounded by friendly people from Indiana, Quebec, Minnesota…..I loved the angles of the beach, waves and dunes here, so that is what I focused on. I’ll be able to shoot this with better lighting when I get home next week - this is a bit pink. 12X12” archival canvas, Work In Progress. Making some progress on this piece. Studying waves is a science unto itself, but very interesting and challenging. And that turquoise! 12X12”, acrylic on canvas board. Thank you very much to the collector from Tallahasse! 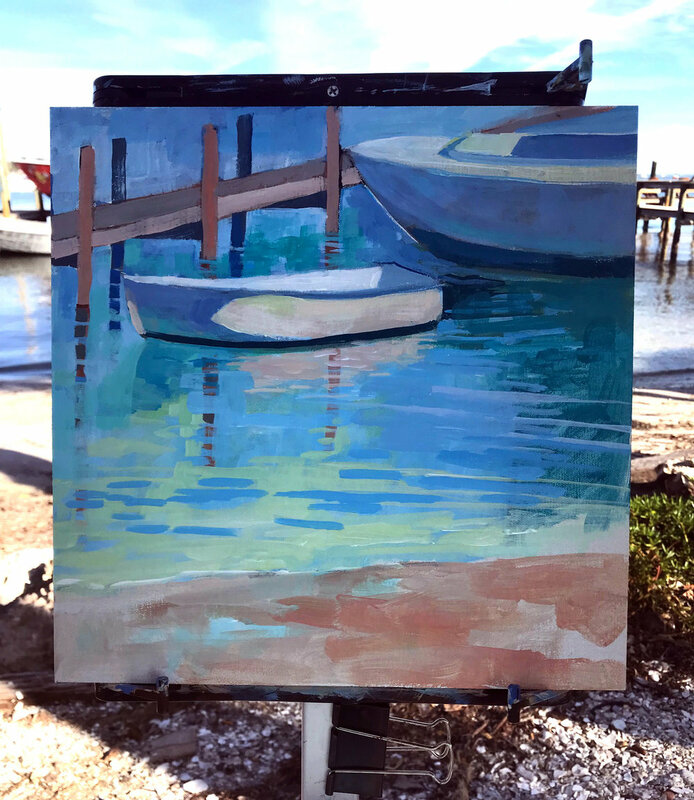 This plein air painting was recently completed at one of my favorite spots along the gulf. The shade spots disappeared as the morning went on, so I painted the early and reflexively. So many wonderful people stopped by to say hello and offer to pose! There are a lot of nice people in the world. Thanks very much to collector of this watercolor plein air painting. This is the Point Reyes, CA estuary, a most beautiful place full of birds, sea lions and peace. This was my first trip to the astounding Point Reyes National Seashore preserve, about 1.5 hours north of San Francisco. I hiked all over the area, and painted this sitting on a hill looking towards the cliffs, watching as the midday tide began to waft in. The gulls and seals were talking to me for the several hours while I painted. A day spent painting at the beach. Those two palms have been friends several times this month; I love the way they’re bent in the wind yet have the best view around. I ended up talking to people who stopped all day long. My faith in humanity is restored. Everyone, to a person, was so kind, funny and interesting. Canadians, New Jersey folk, midwesterners - not a harsh word, and even an offer to purchase. But I can’t yet, I’m not finished. 12X12”, mixed media on archival board. This is a work in progress; I still want to abstract the background a lot more. Painting here was interesting - there’s the Bridge Street Inn Bar right around the corner, so some rather happy patrons stopped by to talk as I painted. It’s a lovely spot as the pelicans dived around me and boats moved in and out of the harbor. There is so much life going on at the beach. I’m surrounded by sun bathers, dune buggies, bicyclists and hikers. Everyone is happy, including me. This mixed media painting is 12X12” on archival board. When I set up this morning it was the shadows and contrast that intrigued me. I’ve painted enough palms in the last few weeks to finally have the hang of their shapes and fronds. That’s the Gulf of Mexico beyond the old pier, where it’s too dangerous to swim due to the riptides. 12X12” on archival board. The Wind Is UP today! 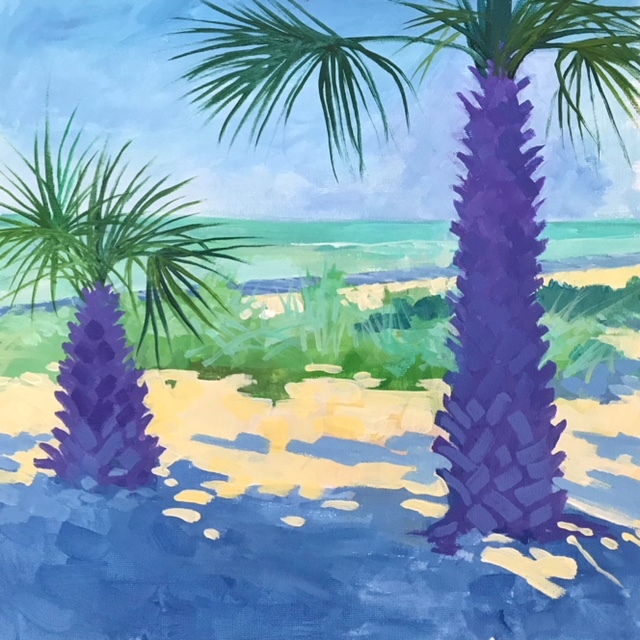 "Coquina Beach, Two Palms"
I’m about bowled over today at 16 knots. The clouds are scuttling across the bright sky and my umbrella wants to fly away. What can I say - enjoying every minute? Getting used to these new paints and how quickly they dry in the wind. It’s always wonderful to get back to some plein air painting. I love when people walking by stop and comment while giving encouragement. The Gulf of Mexico was wild today, with 3 - 4’ waves and lots of surfers in wet suits (it’s got to be cold) trying out their boards. I loved this jetty jutting out into the ocean, and the way the waves angled off of it. This is a WIP/Work In Progress, but it’s getting there. 12X12” on archival canvas and board.